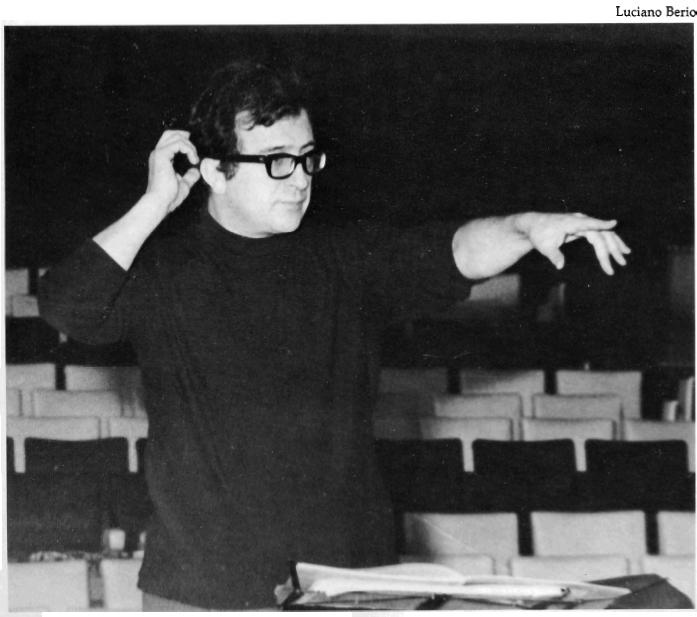 Luciano Berio Interview with Bruce Duffie . . . . . .
Luciano Berio (1925-2003) was born in Oneglia, Italy. After studies with Ghedini at the Milan Conservatory, he worked for the Italian Broadcasting Corporation from 1953 until 1960, when he founded the Studio di Fonologia and directed a concert series under its name. He has taught in America at Tanglewood, Mills College and Harvard University, and in Europe at Darmstadt and Dartington; from 1965 to 1971 he was a member of the composition faculty of the Juilliard School in New York. He ran the electro-acoustic department of IRCAM in Paris until 1980; in 1981 he founded tempo Reale, an institute for new music, in Florence. In 1982 he became Musical Director of the newly founded Regional Orchestra of Tuscany. In 1984 he was Artistic Director of the Maggio Musicale in Florence. In 1988 he became an Honorary Member of the Royal Academy of Music, London. He has also been awarded the prestigious Siemens Prize. 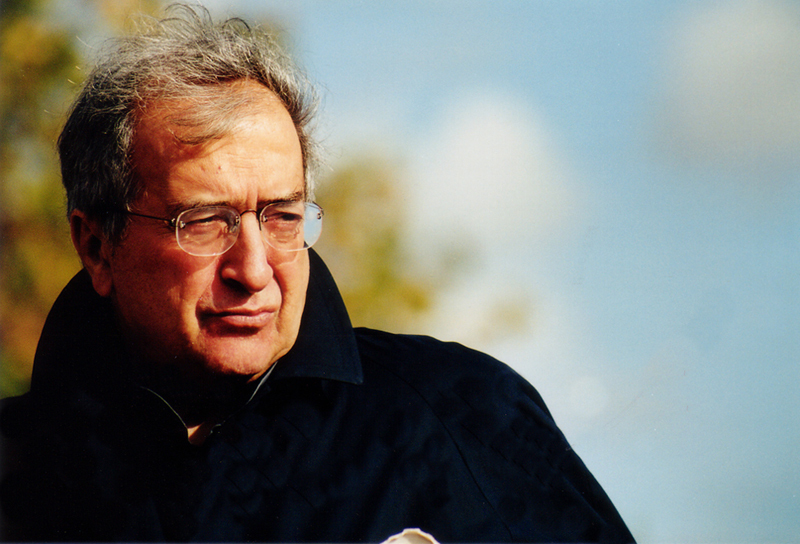 Luciano Berio was certainly a major force in music of the 20th century, and Chicago audiences have had the privilege of getting to know several of his works over the years. Lyric Opera presented Un re in Ascolto, and the Chicago Symphony has done Sinfonia as well as shorter works. They also comissioned Continuo, and it was finally finished and presented at the very beginning of 1993. Since the composer had come to hear his new work performed, it was natural that the CSO Public Relations Department helped arrange this interview. One of their assistants took care of the introductions, and I commented that she made sure people come to the concerts, to which Berio smiled . . . . .
Bruce Duffie: Well, let's just start right there. Do you feel it is the composer's responsibility to help get people to come to concerts? LB: Not at all. First of all, it's a very complex interaction between the composer, the creativity, and the use, the consumption, the market of this creativity. The composer has no time to deal with this, especially now that there's a tendency to industrialize music. BD: [Somewhat surprised at the choice of word] Industrialize??? LB: In a way, yeah; it's necessary. Otherwise, how would this survive? The big musical machinery has kind of industrial characteristics now more and more. BD: Is this a good thing for music, or just a thing? LB: I don't know; I don't judge it. Simply it's reality, especially now with the distribution of music; the quantity of music that's been distributed by recording, and the quality of the concerts, too. Music has a very, very strong presence today, and we have to see what's happening. I don't dare to judge this. BD: Do you view music as a commodity? LB: I don't think music is a commodity. It can be something that you buy in a supermarket and you throw it away! There's a lot of music you can use in this way, but I'm not interested in that music, even if sometimes it's funny to hear and pleasant to hear. I'm far away from that. BD: Then what kind of music interests you? LB: In principle, all musics that have roots in our history, in our experience. They carry traces of the past, but they have a vision of the future, too; not music as an object or as a thing. BD: Music as a being? BD: Is the idea something that's on the page, or is it something that's in the air? LB: Ohhh, that is a big question. It is everywhere! First of all, especially in America, you know very well that music is present in American universities. This is beautiful and very important, but there are faces of this problem. One is that music tends to be present in the university — not only in America, but everywhere — when it's teachable. When you teach, you can break down that specific work, that poetics of a certain composer. You can break it down or you can explain like we explain a thing, a fact, an object. That is the music that enters the repertoire more. But there is now music that cannot be broken down into its ingredients in this way because sometime we don't even know. This music looks into the future. Now, of course, there is a tendency to explain, to analyze everything. This can be very beautiful sometimes, but sometimes I suspect that excessive proofs make truth tired. Braque, I think, said something like that, and this happens also in music. You cannot really place music precisely. That is the beauty of music! BD: Do you want your music to be broken down and analyzed, or just be understood? LB: Both. Of course that happens, and sometime I'm responsible myself, for this, for a certain analytical approach. I like to go deeper in the music I love of other composers, but still cannot formalize he relation to music. Our relation to music must remain open, in a way. This is the privilege of music, not to let itself be formalized, to be locked in a certain procedure, in a certain way. BD: That is your relationship to the music as composer. What is the relationship of the music, then, to the audience? LB: I'm an audience too! I tend to see the audience in the way I see myself. Actually, I'm the best audience in the world, really! [Both chuckle] Audiences have personalities like people, like a person. They have a history; they have genes. Audiences must be educated, too — in a very gentle way, of course, but the relation of the audience to music is very mobile, very different. Certainly a Chicago audience can react differently from a Paris audience or from a Rome audience. The musical institutions have a lot of responsibility in this. Not in a city like Chicago or New York, but elsewhere in America I suppose you can have an audience where they are more or less conditioned by financial aspects. Programs must sell. [Gestures in the direction of the CSO Public Relations person who introduced us] She knows that! LB: [Chuckles mischievously] If the program doesn't sell, if the musical institution doesn't produce well and fast, that can reflect on the economic or financial problem for the institution — which is normal. It's logical. I don't see anything wrong in this, but simply we must be aware. BD: This area is in program building, but are composers themselves being encouraged to make a product that will sell? LB: Mmmm, yeah. There are composers that do this anyway, without being encouraged... [Both chuckle] ...which is normal, too! This happened all the time through the last centuries! Even in Beethoven's time it happened, though Beethoven never made a compromise with the audience, especially after a certain moment of his own development. Can you imagine his last string quartet being written to please the audience? BD: Not really, but yet it does please at least today's audience! LB: Yeah, of course! That makes sense. BD: We're talking about music over a span of time. Where is music going these days? LB: I don't know; many different ways since there's no longer a kind of lingua franca, a language for everybody. To the end of — or actually the middle of — the 19th century, everybody was speaking the same musical language. They could sing in a church, sing opera, hear concerts or just be whistling, it was always the same language. From the moment this broke down, in a way it changed its internal mechanism. There are many languages. That is the beautiful side of our moment, now; we have many, many, many different possibilities. There's no longer a language, but many different languages. So the ideal situation, the way I hope to see the musical development going, is maybe a language of languages. BD: Then do the audiences have to assimilate all of these languages? LB: Yeah; they do it anyway! This has a long history. Why was the conductor first necessary? Not because he had to coordinate a very large number of musician, but simply because he had to educate them to go from one style of music to the other. For instance, Mendelssohn was making these beautiful programs in Germany. I saw a printed program not long ago where Wagner made a version of the Overture of Tannhäuser for him. The program was Wagner and Bach. I don't say Mendelssohn discovered Bach, but he was the one to promote the knowledge of Bach in his own time. BD: He brought it back into fashion. LB: In Leipzig, yeah, and he had to teach the orchestra how to play Bach and how to play Wagner. So the audiences in those times, those eras, were used to jumping from one perspective of music — from one technique, from one expressive quality — to the other in the same program. And our audiences are educated for that. BD: Is it too much to expect even a great orchestra like the Chicago Symphony to play Bach and Wagner and Berio on the same concert, or even in the same season? BD: [Reassuringly, indicating there is no problem] That's all right. LB: I don't believe in that, or in somebody who will specialize in Chopin or Mozart sonatas. A great interpreter can — must — be able, today, to control a very wide landscape of music. I mentioned Pollini and there are many others. Pollini mainly plays Beethoven, but you feel that his hands can perform Schoenberg and Boulez, too. [See my Interviews with Pierre Boulez.] And vice versa; it is something to hear Schoenberg played by the incredible musical mind that plays Bach and Beethoven. Not only in terms of musical conception, but even technically this comes out of the continuity of music. BD: So there is continuity from Medieval through Renaissance and Baroque and Classic, to the newer music? LB: Yeah, no doubt. The type of continuity changes all the time because of many things. History, at least in my idea, is not a linear process. I don't believe that things happen in a deterministic way where there is a cause and there's an effect. No. It is much more complex than that. That is another privilege of music, that society can enter culture from many different ways. There are practical things, too. For instance, at a certain moment instruments changed. Beethoven composed Hammerklavier because instead of the wood frame instrument, the piano had a steel frame, a metal frame, and he became more powerful. The violin, instead of having gut strings, now has metal strings, and the bow is tense. The instrument has to be reinforced — even a Stradivarius — to support this tension. Why? Not for a musical reason. It was simply because the pianist and the violinist had to play no longer to just 50 people, but to 2,000 people. These instruments produce more sound. That, in return, produces many other phenomena in music. BD: Is it then wrong to play music written for gut strings on steel strings? LB: No; it's an ongoing issue, I suppose. It's very important, sometimes, to hear the music of Bach or Mozart, even the early Beethoven, on the old instruments. BD: Then 100 or 200 years from now, do you want your music played on instruments of that time, or on these old original instruments we're using today? LB: I don't care. [Chuckles] But I wanted to say that as long as you don't make a fetish out of using old instruments, it can be musically very interesting. For instance, when you hear the Eroica recorded by Frans Brüggen, he has his own orchestra with old instruments. It's beautiful because you understand the music in terms of phrasing. The tempi are changed. The famous "Marche funèbre" with 90 musicians, [sings the main theme, very slowly and solemnly] "Boh, boh-booooooo, pyoom, puroom, pu-bee..." You meditate, you look at the ceiling or whatever. And the old tempo? [Sings the same theme, this time at a much more brisk tempo] "Bum, buh-beeeeee, byoom, ba-doom, ba-beee..." This is the tempo. It might be also because it was a tune used in the army in Vienna, and it went much faster. So all the phrasing has to be seen in another perspective using these original instruments. BD: So in this specific case, the old orchestra can bring it off and the new orchestra really can't do that as well. LB: Yeah, but this experience of going back to the old phrasing — or what we suppose to be the old phrasing — can affect also the performance with the modern instrument. BD: Let me ask a very easy question. What is the purpose of music in society? LB: [Thinks for a moment] Oh, I don't know; to help people to find harmony between the body and the mind; to educate people to connect these two distant dimensions. It helps you sometimes to fly away. Music is something that you have to do with your body. You listen with your body. In fact, a good musician has to think with his belly and to feel with his brain. That is very important. BD: It seems like you bypass the heart, then. LB: [Chuckles] "Heart" is a metaphor; a bad metaphor. BD: Okay. What would you use in place of "heart," then? BD: [Upon the composer's return] We're just looking at a page of your score; I assume that one of your last considerations is what the page looks like. You're more concerned with what the ear hears, right? LB: Yeah, of course. The problem of the graphic look of that thing is not interesting. When somebody says, "I have a problem notating this," the problem's somewhere else. BD: When you're writing a work and getting ideas, are you always in control of those ideas, or are there times when you let the ideas control your hand? LB: Are you talking about inspiration? LB: [Chuckles slightly] I don't know. Usually I work in a subtractive way. I have a general idea of things, then gradually I come to focus everything in detail. I'm not an additive person who starts from a cell and then builds up something. I tend to have a clear vision of things and then I go into the smallest scale. BD: Have you basically been pleased the way your music has been played over the years? LB: It depends; very often not, especially with solo performers. Sometime there are problems, but it's inevitable. BD: Do you give them suggestions? LB: Yeah, if you have the occasion to do this and it arises. Sometimes they send me recordings, and when to them I listen I get a little depressed. LB: [Chuckles slightly] For a moment, at least. BD: But I hope that most of the time you are inspired with them. LB: Yeah. There are wonderful performances. In the history of music, the quality of the performers has never been so high as now. BD: This is the technical quality; is the musical quality equally high? LB: Yeah; good performers, good orchestras, good groups coincide no doubt. I was recording with Boulez not long ago, and we were remembering Darmstadt. There are certain very difficult works. I remember there was a work by Stockhausen, Kontra-Punkte. It' a very difficult, very beautiful work with a very difficult piano part. There was that excellent pianist, Paul Jacobs; unfortunately he died. He was very devoted, very committed. He practically fainted before going onstage, he was so nervous. He had difficulty, but everything goes smoothly because everything goes through the brain and is assimilated. BD: Does it make for a better performance if the performer does not know at the beginning whether he'll make it to the end? LB: I don't know if that is a problem. BD: You've done quite a bit of teaching. What advice do you have for young composers coming along? LB: For a young composer as a young student, I can only say to educate themself in connecting, again, the body and the mind, the "soul" if you want, and the mind; the belly and the mind, so to educate the ear and the brain together. I often say that for me, the best instrument for this type of education is counterpoint; severe, strict counterpoint. BD: So we're back to Bach again! BD: They have to work in concert? LB: Exactly. They must talk to each other constantly. LB: [Thinks for a moment, then chuckles mischievously and looks at the Public Relations person] Maybe she has the answer. BD: There are a number of recordings of your work. They have more universal circulation and will last for a long time, so are you pleased with them? LB: Yeah, I would say, yes. Some are very beautiful. BD: I assume that you are constantly bombarded with requests for your music. How do you sort it out; how do you decide which offers and which commissions you will accept, and which ones you'll turn aside? LB: I don't work in terms of commissions. I have certain projects that in any case I will do. I work usually on two or three different projects at the same time. Some are very short, very simple; the other one might be more complex. For instance, Continuo is a work that started in '88. Maybe it will be an endless work. By its own nature I can continue working on that forever. Formally it's conceived in such a way that it's like a building to which I can add rooms, I can add terraces, windows and gardens around; there's no end. So, that is a long project, which would last for a long time, and really I don't care for whom this is done. Of course the initial idea, to know that I was doing this work for the Chicago Symphony, was very, very, very rewarding; one of the best orchestras in the world. So by the nature of it, sometimes the work is conceived in such a way that it will have a certain importance. But I am completely free from demands. BD: It's a wonderful way to live! LB: Well, it's the point of my life. LB: Also, yeah, I will say. Well, "fun" is an awkward word. Excuse me, I am very simple. [Chuckles] This same question you can ask to a scientist or a surgeon, or to whatever. To a writer, writing is definitely fun. Yeah. It is obviously the thing I do best, so it's also fun sometimes. It's complex. I think that the creative process cannot be reduced to this word. There are many faces. There's also the fun face, but it's not the most important. BD: Does the creative process ever get too complicated? LB: Oh, yeah; in fact, you always have to question and sometimes you question yourself, but the music is not enough. Maybe sometimes you are bordering regions of ideas that music is not equipped to explore. This happens not only to myself; I suppose everyone has this feeling sometime. In reaching some complex level of thinking, you think maybe music is not enough, but you don't know what else to do because there's not even a name for what you are about to reach! Sometimes I have this feeling in terms of complexity. BD: Thank you for bringing your artistry back to Chicago. LB: Thank you to you. Chicago is a beautiful city and I always loved that. Modern architecture was invented here — Frank Lloyd Wright, Mies van der Rohe and so on. I want to see again the early buildings, the houses of Frank Lloyd Wright. BD: There are quite a few of them still around, especially in Oak Park. With the death of Luciano Berio, aged 77, music has lost more than a marvellous composer who wrote some of the most moving and beautiful scores of the postwar period. It has lost one of its intellectual mentors, one of that handful of radical reforming composers who redrew the landscape of music. With Stockhausen and Boulez, he was a pioneer in the exploration of new technical resources, and in the extension of Schoenberg's serial principle. 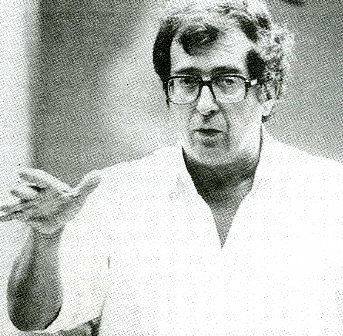 However, what really made Berio's name were those exhilarating pieces of the 1960s and 70s, written when he was living in the United States; from 1965 onwards, he was professor of composition at the Juilliard School, New York. In works such as Laborinthus II (1965) and Sinfonia (1968-69) - which now have the status of modern classics - music, language and theatre were woven into a total experience. In the 1980s, a more grave and reflective tone came over his work, and the echoes of music of the past became more overt - something that many critics, missing the exuberant complexity of his earlier works, held against him. 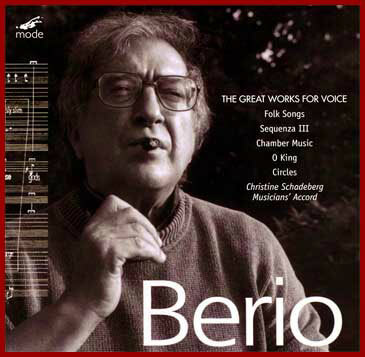 Berio was born in Oneglia, in the remote Italian province of Liguria, and, in his teens, followed in the footsteps of his grandfather Adolfo and father Ernesto Berio, both leading figures in the musical life of the town, which Berio remembered as being hardly changed since Verdi's day. The second world war almost passed Oneglia by; only in the conflict's closing days was Berio conscripted into the army of Mussolini's short-lived northern republic of Salo. After an accidental wounding, he fled from hospital to join the partisans and, when the war ended, he was able to enroll at the Milan Conservatoire. As his course came to an end in 1953, an intellectual revolution was taking place: postwar neo-realism was already being elbowed aside by the neo-avanguardia, which had a similar leftwing stance but substituted for gritty social observation an ironic, often playful, kind of formal experimentation. Two members of this movement would later become Berio's chief collaborators and intellectual comrades-in-arms; the poet Eduardo Sanguinetti and the philosopher Umberto Eco. And in the 1970s and 1980s, Italy's most renowned living writer, Italo Calvino, would collaborate with Berio on his operas La Vera Storia (A True Story, 1977-81) and Un Re In Ascolto (A King Listens, 1979-84). But first Berio had to come to terms with the ideas emanating from the Darmstadt summer school, that hotbed of musical avant-gardism. Here the exploration of new sound-sources, particularly electronics, and the search for ever more rigorous and powerful systems of composing, went hand-in-hand. Inspired by what he heard there, and on his first visit to the US in 1952, he began experimenting with electronics. With the late Bruno Maderna, he co-directed the new electronic studio at the Italian state radio from 1953 to 1960, and in 1958 produced an acknowledged classic of electronic music in Omaggio A Joyce. 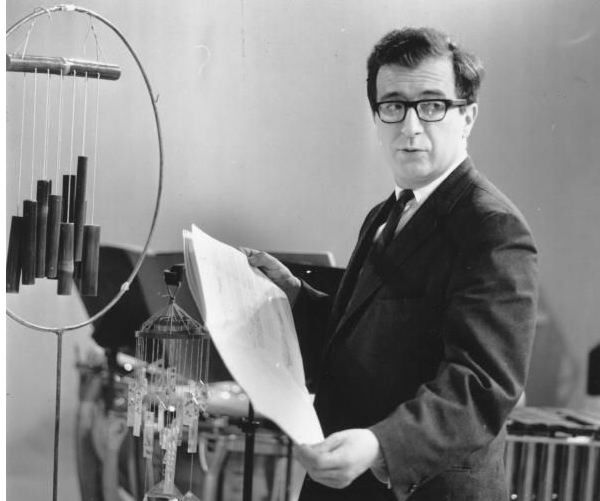 Meanwhile, in his purely instrumental works Berio was groping for a personal form of serialism, one which would have the rigour of Darmstadt total serialism without its suffocating rigidity. Through a series of works in the late 1950s and early 60s, including the Sequenzas for solo instruments (from 1958 onwards), Tempi Concertati for ensemble (1958-59) and Epifanie for voice and orchestra (1959-61, with later revisions), he elaborated ingenious techniques for injecting into the stiff, immutable serial principle the idea of evolving process. The change could be summarised as a move from "always the same thing, seen from different angles", to "the gradual emergence of something, which then dissolves into something else". That something need not be self-created, like a series; it could be something already existing, like a folksong or a fragment of Schubert. Indeed, the boundary between the newly composed and the borrowed could be increasingly blurred, with the result that Berio's music became increasingly tolerant of invasions from outside. "I'm interested by music that creates and develops relations between very distant points, and pursues a very wide transformational trajectory (Beethoven's Diabelli Variations, for instance)." These might be within music itself, both his own and others. But, in the 1960s, they leapt way beyond music into distant areas. These were, first, new sonorities revealed by electronics; second, language, in particular the experiments in multiple levels of meaning found in the neo-avanguardia; and third, theatre. The blurring of boundaries between different artistic forms, and the strategies of listening associated with them, is a constant feature of Berio's music from the 1960s, to the extent that defining the works is often difficult. Take the radio composition Visages (1961), where the material assembled and cross-cut on tape is the voice of Berio's first wife, the singer Cathy Berberian. Is this a vocal composition, a radio drama, an experimental poem, or a study in pure sound? Similarly Circles, written for voice, percussion and harp (1960), is an essay in unusual sonorities, a play on verbal meanings and a piece of proto-theatre. Later works project this fruitful indecision onto ever bigger and more exuberantly filled canvases. Sinfonia, Berio's best known and probably most characteristic work, is a richly complex, hour-long collage, in which spoken and sung texts in many languages are combined with an orchestral score of huge sophistication. The second movement, O King, is an homage to Martin Luther King Jr., in which the phonemes of the martyr's name provide the text. The central movement is a whirlwind of memories of western music, superimposed on the scherzo of Mahler's Second Symphony. This looms up in the texture and then vanishes, only to reappear later, like an underground river breaking surface. Whether the collage of words hurled into the texture amplifies, or distracts from, the work's coherence as music is a moot point. Complexity can sometimes be self-defeating, as it certainly was in Berio's Opera (1970), a many-layered ironic commentary on the genre. More successful was the opera La Vera Storia, in which the second act is a retelling, in a form Berio describes as "oneiric" [dreamlike], of the story told in the first, where it is "real and concrete". Many of Berio's favourite writers - Auden, Shakespeare, Barthes - reappear in his next opera, Un Re In Ascolto, which is a reinterpretation of the stage-within-a-stage device. The passivity of the central figure, who comments and remembers endlessly, but who never acts, is emblematic of the composer's later music, which ruminates quietly on memories of itself. In July 1997, his opera Outis (1995-96) was premiered at La Scala, Milan. Outis is a latter-day Ulysses, who, in five separate narratives, is killed and reborn to undergo allegorical adventures in ever more bizarre surroundings - an ocean liner, a bank, a supermarket. The music, as one reviewer remarked, is "a kind of ocean in which one regularly gets lost and finds oneself again" - an effect heightened by sophisticated electronic treatment of the orchestral sound. In his last years, Berio's productivity, already remarkable by contemporary standards, actually increased. In 1999, his opera Cronaca Del Luogo, a meditation on biblical themes, was premiered at the Salzburg festival. Among the numerous recent premieres, Sequenza XIV for solo cello (2001-02) stands out, as this was the last of his long series of pieces for individual instruments, which began with Sequenza I, for flute, more than 40 years earlier. Like all the Sequenzas, this one does not strain against the limits of the instrument, but pits abstract ideas of evolving harmonic fields against the inherited physical characteristics and historical idioms of the instrument. The pieces are a testament to what Berio described as the slow, majestic evolution of instruments across the ages, an evolution for which he had the profoundest respect. And as if all that were not enough, he threw himself, at the age of 75, into the rejuvenation of that remarkable, but moribund, Roman institution, the unique conglomeration of orchestra, promoter, venue, library and school known as the Accademia Nazionale di Santa Cecilia, of which he became president and artistic director in 2000. Berio's operas were a source of exasperation to British critics, one of whom asked, "Why can Berio never actually state anything?" But the difficulty of plain statement, and the fragmented sense of self of which that is a symptom, are, after all, the main burdens of modernism. And it was to modernism that Berio remained true. He married Cathy Berberian in 1950, and they had a daughter. They divorced in 1964, and Berberian died in 1983. His second marriage, to Susan Oyama in 1964, also ended in divorce, in 1971; they had a son and a daughter. He is survived by his third wife, Talia Pecker, whom he married in 1977; they had two sons. This interview was recorded in Chicago on January 4, 1993. Portions (along with recordings) were used on WNIB in 1995 and in 2000. Portions were also used at a memorial concert at Northwestern University in 2003. An unedited copy of the audio was placed in the Archive of Contemporary Music at Northwestern University. This transcription was made and posted on this website in 2011.